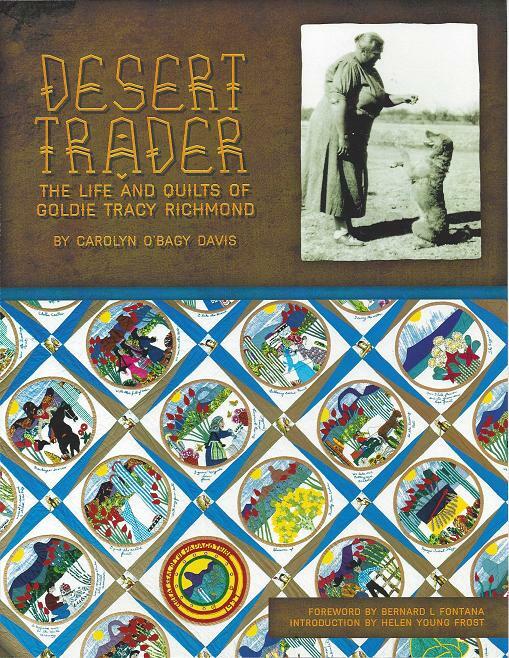 Goldie Tracy Richmond, 1896-1972, came to the southern Arizona desert in 1927 where she and her husband, Marion Tracy, prospected, ran traplines, and operated trading posts. At 6’4”, and 345 pounds, Goldie was a big woman with an even bigger heart—through her generosity and compassion to everyone who crossed her path, she became known as the Angel of the Desert. In 1932 Goldie and Marion opened Tracy’s Trading Post on the Tohono O’odham Indian Reservation. Goldie lived in this isolated area for 40 years, learning the Tohono O’odham language and earning a reputation as the most respected trader on the reservation. Goldie was also an amazing quilter in spite of her pioneer life and dawn-to-dark work. She created appliqué quilts depicting scenes of daily life of her Tohono O’odham neighbors and of the Sonoran Desert, which are revered for their artistic vision and now are preserved in museum collections.